Fixing garage doors in Houston is as simple as getting in touch with our company. And let us assure you that we won’t only tackle your urgent problems with speed but serve all needs. From installing a new overhead door to replacing openers and repairing the cables, you can always expect services expertly done when you trust them to our company. So next time you need service, just make contact with the garage door repair masters in Houston, Texas. Whenever you are dealing with problems, contact us and expect same day garage doors repair in Houston. No problem is good for you. From track dents and rusty rollers to broken springs and cables off the drum, they all bring the garage door to a halt one way or another. Since it’s not safe to use the door even if the problem still allows you to move it, don’t do it. Let the experts take care of the issue before it becomes a bigger problem. You can count on our company for fast garage door service no matter what you need. From spring repair and cables replacement to adjustments, maintenance, lubrication, and opener repair, we are at your service. We are honored to work with the best local techs and will be honored to help you regardless of the garage door brand and type. So if you want service you can trust and promptly, all you have to do is contact our garage door company. Time to get new garage doors? Our company will be of service one more time and will still cover your needs in a prompt and professional way. You see, we are not just a service provider but experts in sales too. 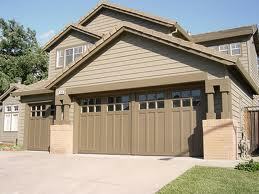 We can provide you with new sectional, rollup, carriage-style, flush style, and all types and designs of garage doors. If it’s time for garage door replacement, just get us on the phone and get your project started. A pro will be sent to assist you whenever it’s suitable to you and the new door will be installed with the utmost precision the day of your choice. Allow us to help with any project and all services. Do you want to convert your Houston garage doors? Need same day repair? Want to install sectional doors? Call us now for a quote or service.